I found a great recipe in the IDEA Fitness Journal, Volume 14, Issue 4. It was reprinted with permission from the second edition of The Cancer-Fighting Kitchen by Rebecca Katz (Ten Speed Press). I’ve tweaked it a bit to make it significantly faster to prepare and to give a few more options. 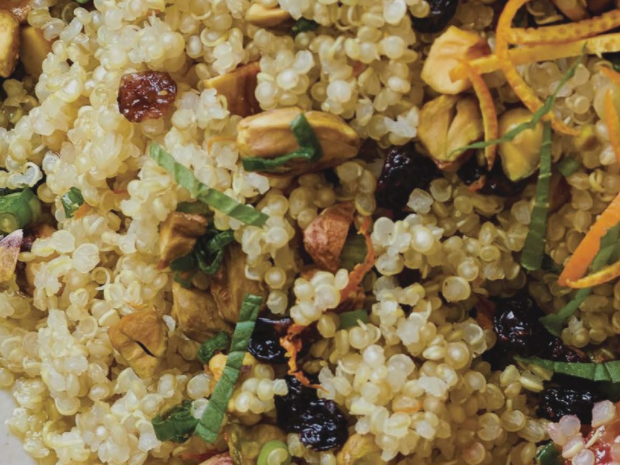 Trader Joe’s has cooked quinoa in their freezer section if you want to make this recipe super quick. 1 box is 2 C, use 1-2 boxes and adjust the other ingredients if needed. If time is not of the essence, save some cash and cook your own quinoa according to the directions on the package. Put all ingredients in a large bowl. Mix well and taste; you may want a pinch of salt, an extra squeeze of lemon or a little more olive oil, etc. For a variation that turns this dish into a meal, add 1 can of drained and rinsed chickpeas (or other bean of your choice) when you stir it all together. Keeps well in the fridge.